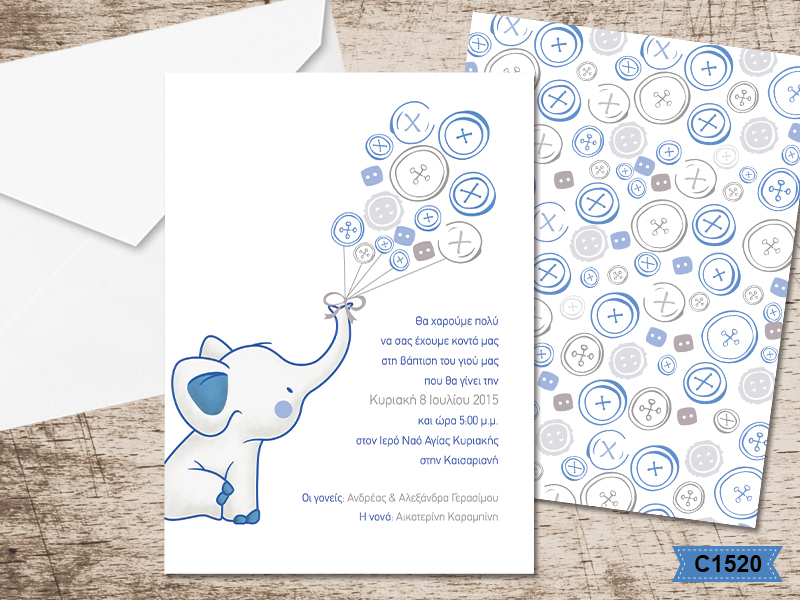 Beautiful Greek Christening invitations for your baby boy, comining in a blue-grey buttons pattern paper, with a very cuty elephant, holding with his nose buttons look like balloons. The matching envelopes are square white paper and your personalized wording is printed in baby blue and grey colours. Unit price euro. Printing price: 65 euro total (VAT included). Shipping cost not included. https://www.preciousandpretty.com/2017/05/greek-orthodox-baptism-invitations-elephant-themed-for-boy-C1520.html Greek Wedding Favors|Orthodox Crowns|Stefana|Baptism Invitations Greek Orthodox Baptism invitations elephant themed for boy C1520 Greek Baptism invitations elephant themed for boy Product #: Greek Wedding Favors|Orthodox Crowns|Stefana|Baptism Invitations_5603976985674680197 5 stars out of 5 reviews.